BIG STONE GAP, Va. – Another group of medical residents is reinforcing Wellmont Health System’s commitment to develop highly skilled physicians and increase access to primary care in Southwest Virginia. 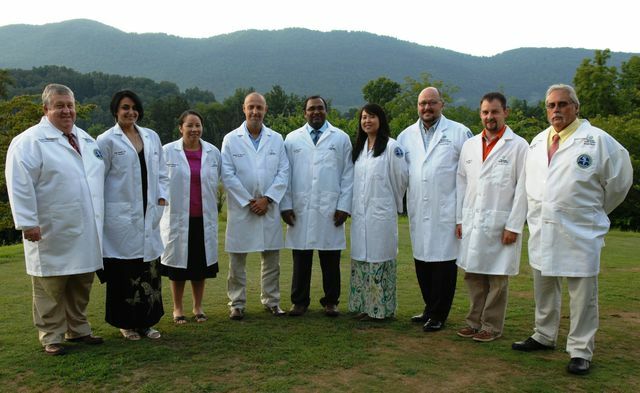 Seven physicians who have enrolled in the osteopathic family medicine residency program created by Wellmont recently participated in a white-coat ceremony at Lonesome Pine Country Club. They are the third class to have joined this innovative program that is bolstering the level and quality of care for patients in this region. The program now has about 20 residents and is nearing the maximum of 24 Wellmont has been approved to enroll. “This is excellent news for those who live and work in Southwest Virginia and shows the value of starting this program in Southwest Virginia,” said David Brash, Wellmont’s senior vice president of business development and rural strategy. “Young physicians are finding this program an attractive route to refine the skills they need to practice in rural areas, including our own. Dr. David Bhola, Nova Southeastern University College of Osteopathic Medicine, Ft. Lauderdale, Fla.
Dr. Menalin Ganal, Touro University College of Osteopathic Medicine, Vallejo, Calif.
Dr. Dwayne Likens, University of Pikeville Kentucky College of Osteopathic Medicine, Pikeville, Ky.
Dr. Veronica Robinson, A.T. Still University School of Osteopathic Medicine, Mesa, Ariz. The family medicine residency lasts three years, and all the osteopathic physicians except Dr. Yount are in their first year. He transferred to the program here and is now in his second year of residency. “We are thrilled with this class of physicians and are grateful they have chosen our program to advance their medical careers,” said Dr. Maurice Nida, Wellmont’s director of osteopathic graduate medical education and an osteopathic physician with Wellmont Medical Associates. “All of them come from impressive medical schools and will provide excellent medical care under the guidance of experienced physicians who have graced our region with their expertise. As they complete their residency, these seven physicians will deliver compassionate care at Mountain View Regional Medical Center, Lonesome Pine Hospital and Lee Regional Medical Center in Virginia. They will also receive some of their specialty rotation training at Holston Valley Medical Center and Bristol Regional Medical Center in Tennessee. In addition, these physicians will improve patients’ lives by treating them at the Wellmont Osteopathic Family Medicine Residency Clinic at 295 Wharton Lane, Norton. The residency program was formed in 2009 with LMU-DCOM as the academic sponsor. The program began accepting physicians in 2010. Four residents have graduated from the program so far, and another is set to finish her training in February. Of those, two of them, Dr. Aaron Porter and Dr. Addison Ward, both osteopathic physicians, have established practices with Wellmont Medical Associates in Southwest Virginia. Now, this new class of seven residents is ready to make its mark on the region. “We look forward to watching these residents hone their medical skills and hopefully choose to open a practice in Southwest Virginia,” said Dr. Thomas Roatsey, the osteopathic family medicine residency program director and another osteopathic physician with Wellmont Medical Associates. For more information, please visit www.wellmont.org. Seven physicians and leaders of the osteopathic family medicine residency program pose after the recent white-coat ceremony. They are, left to right, Drs. Maurice Nida, Zehra Hussain, Veronica Robinson, Anthony Yount, David Bhola, Menalin Ganal, Dwayne Likens, Joshua Yeary and Thomas Roatsey.